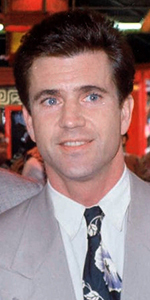 Mel Gibson at the premiere of Air America at Mann's Chinese Theatre, Hollywood, California, Thursday, August 9, 1990. Photo courtesy of Alan Light. Mel Gibson is the very well-known actor from the Lethal Weapon series, who went on to star in an direct his personal project Braveheart, and bagged a bunch of Oscars the while. Assummed to be Australian, Gibson was actually born in the U.S. Today, after a patchy time, he seems to be making a comeback of sorts. Born to Irish-American stock, Gibson's father suffered an injury as a railroad worker; his settlement with the rialroad allowed the large Gibson family to relocate to West Pymble outside of Sydney, Australia, when Mel was 12 years old. He was educated by the Christian Brothers in Wahroonga, New South Wales. Trained at the National Institute of Dramatic Art (NIDA) in Sydney, Gibson was a natural attention-getter. Before graduating, he played the title role in Romeo and Juliet with Judy Davis in the other title role. So his interest in Shakespeare and history go waaay back. He was cast for four episodes of The Sullivans, aired over the Nine Network in Australia, beginning in November, 1977, then appeared in a low-budget surfing movie, Summer City (released in December, 1977). He got paid 400 bucks to be in the film. He did a documentary explaining to children how a television studio works on The Hero, aired by the Australian Broadcasting Corporation in March, 1979. Surgeon-turned-director George Miller went to NIDA looking for a "spunky young guy" to play the title role in a little film he was making: Mad Max (released in April, 1979), made Gibson an international star practically overnight. The film made a buttload of money. Continuing to work in what was called the "Australian New Wave," Gibson starred in a film adaptation of popular Australian author Colleen McCullough's novel Tim (released in July, 1979), with Piper Laurie. Australian director Peter Weir included Gibson to star in his war film Gallipoli (released in August, 1981), which became another internationally-embraced film from down under. Both Gibson and Miller made a sequel to Mad Max for Warner Bros. called The Road Warrior (released in December, 1981). Now, Hollywood wanted Gibson to headline in films. Director Weir put Gibson in his romantic thriller The Year of Living Dangerously (released in December, 1982) for MGM/UA. Gibson played Fletcher Christian to Anthony Hopkins' Captain Bligh in The Bounty (which premiered at the Cannes Film Festival in May, 1984). 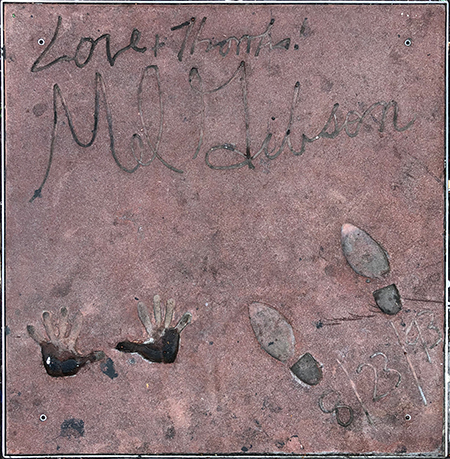 Gibson's first film shot in the U.S. became The River (released in December, 1984), with Sissy Spacek; he earned his first $1 Million dollar paycheck for appearing in Mad Max Beyond Thunderdome (released in June, 1985), with Tina Turner. 1990 was a busy one for Gibson; he starred with Goldie Hawn in the comedy Bird on a Wire (released in May, 1990); starred with Robert Downey, Jr. in Air America (which had its world premiere at the Chinese in August, 1990), and Warner Bros. allowed him to star in a low-budget edited-down version of Hamlet (released in January, 1991), with Glenn Close. Gibson appeared with Glover and Joe Pesci in Lethal Weapon 3 (which played the Chinese in May, 1992), becoming his fourth most successful grosser. He made his directing debut with The Man Without a Face (released in August, 1993), then teamed with director Richard Donner again for Maverick (released in May, 1994), with James Garner and Jodie Foster. All this led to Gibson's greatest triumph: his telling of the tale of Scottish warrior William Wallace in Braveheart (released in May, 1995). He not only starred in the picture, but he co-produced and directed it, winning Oscars for Best Picture and Best Director. You gotta see it. Gibson then provided the voice of John Smith in Disney's animated version of Pocahontas (released in June, 1995). Continuing with Disney brought us Ransom (released in November, 1996), which was another substantial hit as was Conspiracy Theory (released in August, 1997), with Julia Roberts. With six years between episodes, Lethal Weaopn 4 (which played the Chinese in July, 1998), showed the franchise still had plenty of gas in the tank. The neo-noir crime picture Payback (which played the Chinese in February, 1999), did well, while Gibson did a voice on The Simpsons sending up his Mad Max persona in an episode called "Beyond Blunderdome" aired over the Fox Network in September, 1999. Still absorbed in historical action pictures, Gibson starred in director Roland Emmerich's The Patriot (released in June, 2000), with Heath Ledger. Then, for contrast, he co-starred with Helen Hunt in the comedy What Women Want (which played the Chinese in December, 2000). Gibson's writing partner Randall Wallace directed him in the Vietnam era story We Were Soldiers (which played the Chinese in March, 2002), with Madeline Stowe, which did well also. Signs (which played the Chinese in August, 2002), with Joaquin Phoenix, became the biggest grosser of Gibson's career. He took a small role in and produced a feature-length version of The Signing Detective (premiered at the Sundance Festival in January, 2003), with Robert Downey, Jr.
Then came another triumph. Directing on a fairly low budget, and doing the dialog in Latin and Aramaic, The Passion of the Christ (released in February, 2004), with Jim Caviezel, was a brutal look at the Passion story and became a runaway hit. So big, that Disney allowed him to film Apocalypto (released in December, 2006), in the Ancient Maya language. He got by with it. Then, a July, 2006, encounter with law enforcement in Malibu turned into a industry-wide shunning of Gibson for his problems related to alcohol abuse. He began to climb out of the hole with Edge of Darkness (released in January, 2010). Director Jodie Foster took a chance and cast Gibson in the lead of her quirky film The Beaver (released in March 2011), but audiences weren't ready for quirky Gibson. The Expendables 3 (released in August, 2014), with fellow Forecourt honorees Sylvester Stallone, Harrison Ford and Arnold Schwarzenegger. His directing of the World War II film Hacksaw Ridge (released in November, 2016), with Andrew Garfield, was so highly regarded that there was talk of Gibson making a Hollywood comeback; but before that could happen, he would have to co-star in Daddy's Home 2 (released in November, 2017), with Will Farrell. Mann's Chinese Theatre, Hollywood, California. 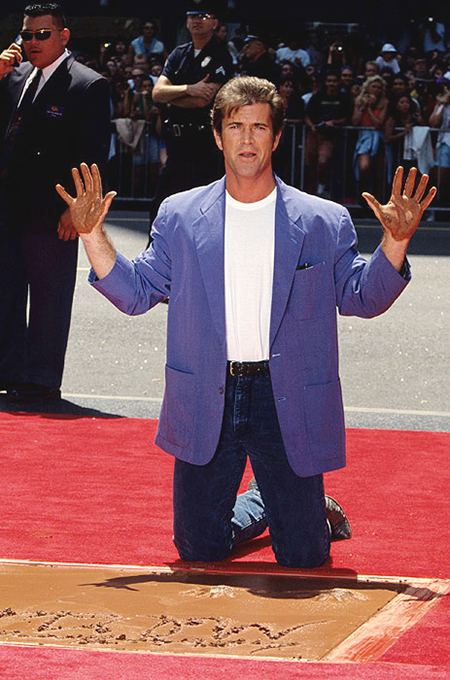 Mel Gibson Forecourt ceremony, Monday, August 23, 1993. Mel Gibson gives the high sign to the crowd.